The golden redhorse is a smaller-bodied sucker with large scales and a short dorsal fin. The lower lip is broken into parallel folds, and the rear margin of the lower lip forms a V-shaped angle. Total length: 9 to 15 inches; maximum about 17 inches. Occurs in pools and riffles of moderately clear permanent streams with moderate siltation, moderate current, and gravel or rocky bottoms. The most commonly gigged sucker in Missouri. Forages on the bottoms of pools for various invertebrates, such as larval midges, mayflies, and caddisflies. 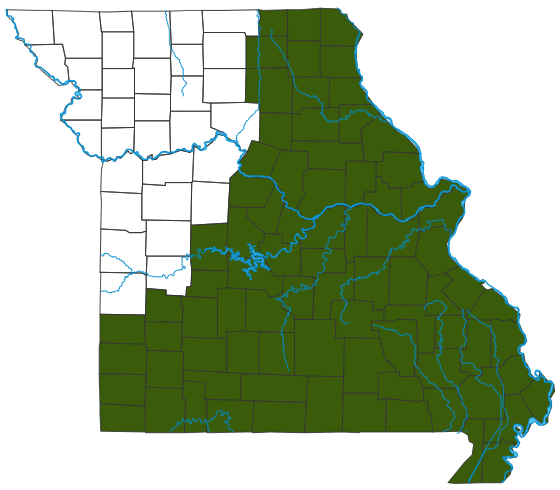 Ozark and northeast Missouri streams. Nongame. Also called "yellow sucker" and "golden sucker." Individuals can live for 11 years or more. Much of the gigging and snagging harvest of redhorse suckers in Ozark streams is of this species and its relative the black redhorse ("white sucker"). Also caught on hook and line. Scored and deep-fried, the Y bones disappear; the firm, sweet flesh is delicious. We often don't think about the interconnections between aquatic food chains and terrestrial ones, but when bottom-feeding redhorses limit ("check") the populations of aquatic larval midges, mayflies, and caddisflies, they influence how many of these insects live to become flying, terrestrial adults.